Buying a house is a BIG deal, especially when it’s your first time. In the minds of some borrowers, the idea of a mortgage produces visions of money-hungry loan officers and huge stacks of paper. But with innovative online tools and a total commitment to customer service, Guaranteed Rate flips that notion on its head by making the home-buying process easier, faster and more transparent than ever before. Changing the way you purchase a home, however, doesn’t change the fact that it’s complex and requires practicality, honesty, organization and trust. Although no two people or situations are the same, there is a general process that you can follow in order to make this big decision as smooth as possible. Over the coming months, we will offer a step-by-step guide to buying a new home through detailed articles posted on this site. This article will serve as the overview of the roughly twenty steps to follow. 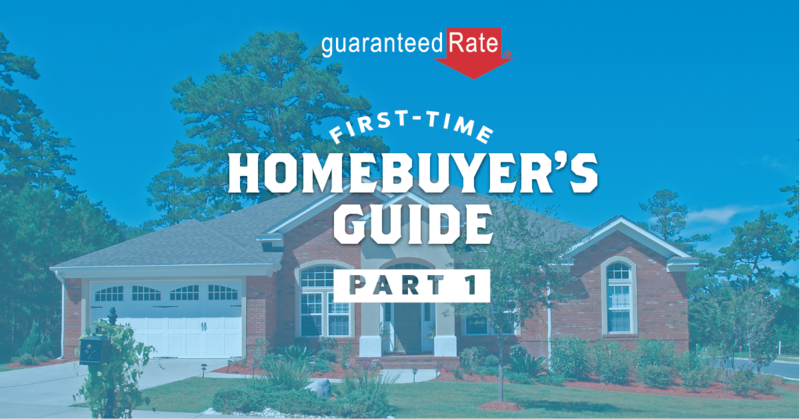 Each will include the phrase, ‘First-Time Homebuyer’s Guide’ in the title, as well as a number reference so you can track accordingly. It might sound simple or silly, but you’ll need to determine why you want to buy a home before you make the decision. For instance, is it a financial decision or a status decision? If you’re looking to own a home because it sounds cooler than saying you’re a renter when you’re asked the question at a cocktail party, chances are you’re not ready. If you do the math and determine it would make financial sense to own, then you’re on your way. Other reality checks involve your credit history and what you can reasonably afford as a monthly payment. Only you know how responsible you’ve been with money and what kind of financial cushion you can maintain if something unpredictable happens. If you’re living check to check or your life is colored by late payments and frequent calls from creditors, home ownership may not be for you right now. Conversely, if your savings account is healthy and growing and you pay bills on time or ahead of time, you likely can feel confident about moving on to the shopping phase. So you’ve made the decision to go forward with buying a new home. Hurray! The next step is to shop and compare loan products. Guaranteed Rate’s Intuitive Loan Finder is ideal for this purpose. It’s an incredible online tool that lets you find the perfect mortgage by asking simple, straightforward questions that you can answer without having to consult financial advisors, tax records or bank statements. You can sort data according to your particular needs and preferences, including whether you’re seeking a fixed or adjustable rate product, or whether you want to find the lowest interest rate, monthly payment or term. The best part of the Intuitive Loan Finder is that it takes roughly one minute to complete. Then you’ll be referred to a loan officer who can answer any questions you may have, because finding the right mortgage expert is as important as finding the right mortgage product. Now that you have a loan officer who answers questions knowledgeably and patiently, it’s time to find your perfect home! A local real estate agent is key to this process, since they will have access to the MLS database, a complete source of for-sale listings that gives you the maximum set of homes to choose from. Your agent will also know the important details of the neighborhoods that interest you, including average home value and the quality of nearby schools, among other factors. Once you think you’ve found the home of your dreams, you’ll enter into a tentative contract with the seller and put down earnest money, which indicates your intention to buy. Now you’re ready to apply for the home loan. Guaranteed Rate’s Digital Mortgage is designed to make this step faster, easier and more transparent than ever. You’ll receive free credit scores from all three credit bureaus, and if your scores are adequate, next will come real approvals* from Freddie Mac or Fannie Mae for the loan amount you and your loan officer have decided you can afford. You can then upload financial documents in a secure environment, making a face-to-face appointment at the bank a thing of the past. Before proceeding, you’ll want a trusted professional to perform a home inspection, because a house that looks amazing on the outside may have hidden problems that would turn your dream into one long nightmare. Once it comes back clean, all that’s left is the closing. This can be a stressful part of the process for many borrowers, which is why Guaranteed Rate is dedicated to holding your hand the whole way! Your loan officer will have provided an estimate of costs prior to closing, and at this stage will give you a breakdown of actual costs. This is an important time to ask as many questions as it takes for you to understand what you’re being charged for. Some people prefer to retain separate legal counsel during closing, while in some states it is a requirement. Escrow accounts could be used to manage your finances and mitigate risk to the lender, though you may have options as to whether you’d like to use them. After all the information and paperwork has been processed, your patience and perseverance will be rewarded with a set of keys to your new home! The only thing left to do is plan your house warming party! Part 2: Why do you want to buy a house? *Automated loan approvals are subject to Guaranteed Rate review and approval of all required loan documentation and does not represent an interest rate guarantee. “Online.Anytime.Anywhere” means available online 24/7 and applicant(s) must be a US Citizen or a qualifying US Resident Alien to apply and the subject property must be located in the US. “Digital Mortgage” means electronic completion of the following: loan application, upload of loan documents, request of the appraisal and automated underwriting decision. It does not include Guaranteed Rate’s review of loan documents or the loan closing process. “Choose your own loan type & rate” means applicants must select from available loan types and interest rates based upon loan features and applicant eligibility. “Securely upload and digitally sign your loan documents” is based upon the loan type selected and some loan documents may require a wet signature. “If Applicant self-reports credit score as “needs improvement,” Guaranteed Rate will not run credit or provide free credit scores via the Digital Mortgage. Applicant may request credit scores by contacting Guaranteed Rate.” “Real Approval” means an automated underwriting system approval based upon credit information supplied by applicant and subject to Guaranteed Rate’s review of loan documents. Applicant subject to credit and underwriting approval. Not all applicants will be approved for financing. Receipt of application does not represent an approval for financing or interest rate guarantee. Restrictions may apply, contact Guaranteed Rate for current rates and visit www.rate.com/restrictions for more information.